For the 1932 Gloria Swanson film of the same title, see Indiscreet (1931 film). 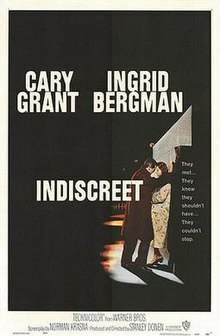 Indiscreet is a 1958 Technicolor British romantic comedy film directed by Stanley Donen and starring Cary Grant and Ingrid Bergman. An actress falls in love with a man she believes to be married, who is secretly concealing from her the fact that he has no wife. The film is based on the play Kind Sir by Norman Krasna. This was Grant's and Bergman's second film together, after Alfred Hitchcock's Notorious (1946), and was one of the first films to popularise artistic use of the technique of split screens. The film was remade for television in 1988 starring Robert Wagner and Lesley-Anne Down. Anna Kalman is an accomplished London-based actress who has given up hope of finding the man of her dreams. Through her brother-in-law she meets a handsome economist, Philip Adams (Cary Grant), and they fall in love. However, he is keeping a secret from her. As opposed to being a married man who pretends to be single, Philip (Grant) is a bachelor who pretends to be married. When she learns of his lie, Anna becomes furious and works out a plan to get even. However, after an open conversation they plan to get married. Kind Sir is a play that was originally directed by Joshua Logan. It ran for 166 performances. It was originally announced that the film would be made with either Marilyn Monroe or Jayne Mansfield, and with Clark Gable as the male star. The film was one of the most popular at the British box office in 1958. Indiscreet was nominated for three Golden Globes, two BAFTAs and one Writers Guild of America award, but failed to win any of them. ^ "Indiscreet - Box Office Data". The Numbers. Retrieved 14 November 2011. ^ Louella Parsons: Mary Martin Role Tailored for Monroe, The Washington Post and Times Herald (1954-1959) [Washington, D.C] 11 Oct 1956: 48. ^ "AFI's 100 Years...100 Passions Nominees" (PDF). Retrieved 19 August 2016. Look up indiscreet in Wiktionary, the free dictionary.